Iran marked the 25th anniversary of the downing of an Iran Air Airbus A-300 by a U.S. Navy warship. 290 passenger and crew lost their lives in the 1988 incident. “Based on regulations of the International Civil Aviation Organization, the Americans are responsible for the incident and the casualties,” said Brig. Gen. Farzad Esmaili, commander of Khatam al-Anbiya Air Defense Base during a commemoration gathering in Tehran on Wednesday. “They (the U.S.) did compensate the victims, but they never accepted responsibility for the incident, “ Gen. Esmaili added. The Airbus A-300 had just taken off from the southern Iranian coastal city of Bandar Abbas en route to Dubai when it was targeted by two Standard missiles fired from USS Vincennes. Following the incident, U.S. officials said their warship mistook the jetliner for an attacking Iranian F-14 fighter plane. Washington later paid compensations for the Iranian victims and the aircraft. 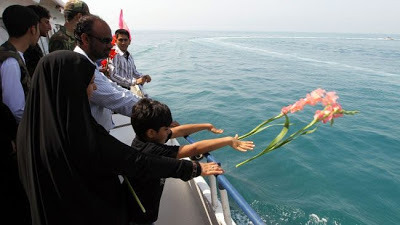 Today, a group of Iranians also gathered at the site of the incident in the Persian Gulf and threw flowers into water in memory of their relatives killed onboard the airplane (as shown in a photo by IRNA). God bless Captain Mohsen Rezaian and the souls of 290 mostly women and children murdered by the US cowards, knowing full well that the radar signature of an Airbus is totally different than a military aircraft. The US radar of the most modern USS Vincennes could easily distinguish that but the US murdering thugs wanted to demoralize the Iranian population as Iran had refused to yield to their puppet crazy Saddam despite fighting 8 years literally against the whole world. Like most modern aircraft, the Iranian Airbus A300-B2 airliner was equipped with an aircraft identification transponder, a modern form of the "identification, friend or foe" (IFF) system of World War II. When interrogated by a radar signal from a potential adversary, the transponder "squawks" (gives off a specific response signal) in a specified, fixed mode. As the Airbus was a European aircraft it had completely US synchronized IFF systems that even a trained monkey would have picked up and identified as a civilian airliner. US has tracked the Airbus as it left Bandar Abbas, and Captain Rezaian was an experienced pilot operating in a hostile environment and right after taking off from runway 21, Flight 655 had turned on all transponders and IFF systems knowing full well the bloodlust and anti-Iran nature of US ships who had been attacking Iranian ships and oil platforms to support Saddam throughout the Jange Tahmili. This was even one of the worst war crimes even by degenerate US behavior around the world and before the days of wikileaks. Iran will never forget this wanton murder of its civilians by warmongering barbarians, who never even apologized and even gave the idiot Will Rogers a medal for murdering civilians. SHAMEFUL. One of the saddest days of my life ! It was actually a kind of the most cowardly, dirtiest and bloodiest revenge taken by the world's Zionist superpower against the great nation of IRAN which of course none other than due to the holding of 52 American diplomats hostage held captive at the U.S. Embassy in Tehran for four hundred forty-four days. Moreover, the total failure of the U.S.'s codename 'Operation Eagle Claw', and the humiliating public debacle that ensued, damaged American prestige worldwide are surely the main reasons to such an inhumane event. Very sad day, thoughts and prayers to the families. I remember all the kids in my school laughing and celebrating when they heard the news. Not surprising. zionists love mass killings, especially of civilians. everyone should mourn the violent deaths of innocent people. I am extending my deepest symphaty to the Iranian nation in a commemoration of this anniversary and its fight against foreign imperialists..